Yesterday [June 2], Premier and Minister of National Security Michael Dunkley welcomed several hundred captive insurance professionals at the Bermuda Captive Conference [BCC]. The Bermuda Captive Conference is currently taking place at the Fairmont Southampton Princess and is considered one of the foremost events for industry professionals. At yesterday’s opening, Premier Dunkley took the opportunity to extend his thanks and appreciation to BCC Chairman Tom McMahon for his hard work in attracting hundreds of key stakeholders to Bermuda’s shores. A spokesperson said, “Also at the event yesterday was Ms. Carolyn Snow, the President of the Risk and Insurance Management Society [RIMS]. Ms. Snow joined Minister of Finance Bob Richards in a panel discussion to discuss the current global economic recovery. Premier Dunkley said that he was pleased to “roll out the red carpet” for Ms. 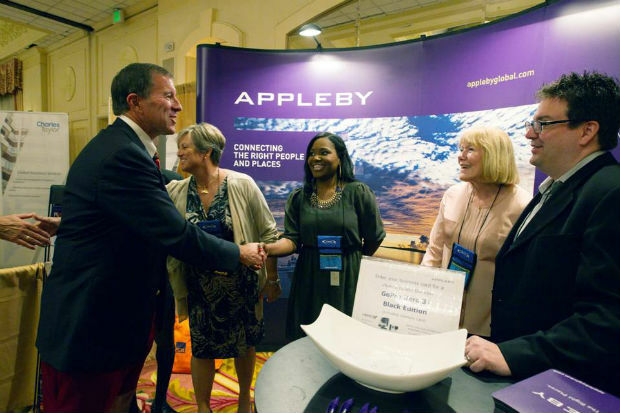 Snow as she has been very hospitable to the Bermuda delegation when they visited the RIMS conference. “The 2013 statistics shared by the Bermuda Monetary Authority indicate that Bermuda closed out last year on a particularly high note with a significant number of new insurance company registrations. The stats indicated that 91 new insurers were registered, including 24 new captives and a record 51 special purpose insurers were formed, along with 16 commercial insurers. “Additionally, the Premier highlighted Minister of Education and Economic Development Dr. Grant Gibbons’ announcement, shared a few weeks ago, that noted that the increase in the number of new registrations in 2013 has continued into the first quarter of 2014. In fact, a snap shot reveals that new company incorporations, both local and international, for the first quarter of 2014 were 17 percent higher than in the first quarter of 2013. “Over the past five and half years, since the global economic collapse, we have seen an increase in competition, with jurisdictions aggressively jockeying for precious business,” Premier Dunkley said. “With our financial services sector being the single largest contributor to Bermuda’s prosperity, this Government recognizes the critical importance of nurturing and protecting our relationships with our industry partners – most particularly those of you in the captive sector. The Premier said, “Our mandate is to compress the time taken to obtain the necessary approvals to stimulate and encourage direct inward investment into our island. We have had some significant success with improving the pace of approvals required for a wide range of circumstances, from work permits to planning approvals to company formations. Premier Dunkley said, “I feel quite confident that Bermuda is poised to succeed in the global arena despite increased competition in a fluctuating economic environment. “We are a competitive, efficient, and stable financial centre operating with integrity and we are open for business. Government will continue to listen, collaborate and take action to keep our doors open. We appreciate that positive partnerships have been and will continue to be critical to the overall success of all of the representatives at this conference. We are very pleased the Bermuda Captive Conference has recognized us as a committed partner in this initiative. Things are looking up when we have Government spokespeople who know what they’re talking about. What was that old saying:”It’s one thing to be thought a fool and another to open your mouth and eliminate all doubts”? I agree, Premier Michael H. Dunkley is a far better representative of the people of Bermuda…at any / all level!